No replies were forthcoming from the relevant authorities on the source of the slime. 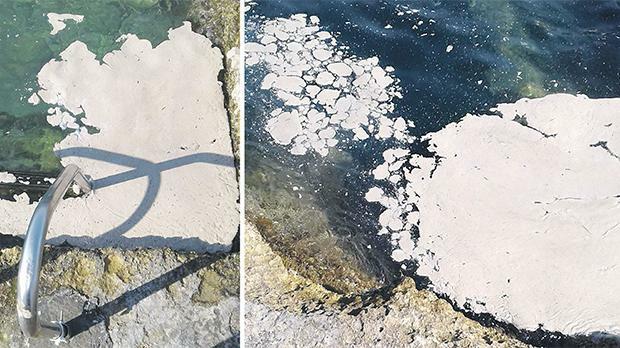 Sea slime appeared along the coast in Marsascala, Sliema and other areas on Tuesday, prompting fears of a repeat of problems that plagued beaches two years ago. The reemergence of slime prompted a prompt response from the fish farm operator lobby, which in a lengthy statement issued on Wednesday announced a series of self-regulatory measures to run until the end of October (see below). In 2016, the widespread incidence of a similar, oily slime led to public outrage and the eventual suspension of permits for tuna farms around the island after they were identified as the source. The farms have since been given new permits to operate in designated aquaculture zones around six kilometres offshore, coupled with more stringent environmental measures to prevent a recurrence. However, Tuesday's slime drew particular concern, as it coincided with the start of the tuna feeding season. Two years ago, the use of a new fish feed with a higher fat content was identified as the main cause. The Environment Ministry did not respond to questions on the source of the slime and whether any measures had been taken. Industry sources told the Times of Malta that the incident had caught fish farm operators by surprise, as it had come about early in the season while they were implementing new environmental management procedures. They said the slime had likely been exacerbated by environmental factors and that operators were not expecting widespread problems similar to those in 2016. Four tuna farms are currently operating at two offshore locations, one in the south of Malta and one off Sikka l-Bajda in the north, having relocated there on the Planning Authority’s orders. Read: Is it a wave? Is it a fish? No, it's slime! The relocation to the north zone, which took place last year, was intended as a temporary, two-year measure until the approval of a formal aquaculture zone on the same site to complement the one in the south, which is operating at full capacity. An application by the Fisheries Department is still before the PA.
One of the farms operating in the north of the island has since applied to double the number of cages on site (without increasing the total amount of tuna they hold), as the quality of its fish had been hit by the imposed relocation. The Democratic Party last week objected to the move and called on the authorities to step up enforcement before processing other fish farm applications. Fish farm operators reacted to news of sea slime spreading across the coast by announcing that they had agreed to a variety of mitigation measures, to run from August to the end of October. The agreement, which has been signed by four out of Malta’s five fish farm operators, establishes a set of common standards operators must abide by when feeding penned fish. These include having booms to collect oily residues and assigning a skimmer-equipped boat to each pen, which will be responsible for collecting any waste material in the area. Operators will also set up a call centre to receive complaints from members of the public and would be paying for two boats to patrol the coast and pick up marine litter wherever they found it, the Federation of Maltese Aquaculture Producers said. In a statement, the Federation said the four operators - AJD Tuna Limited, Fish and Fish Limited, Malta Mariculture Limited u MFF Limited – had also agreed to have the Federation appoint an assessor tasked with overseeing fish farm practices and reporting back on their adherence to agreement conditions. The Federation added that it would be reserving the right to instruct signatories not to feed their fish if and when needed, and that it remained committed to keeping the public informed of any developments. The agreement was signed in Japan, where key representatives of fish farm operators are accompanying Prime Minister Joseph Muscat on a trade mission.